2008 was a notoriously inconsistent year in the Rhone Valley. You’ll often fine this vintage at a much lower price than the famous 2007 or 2010 vintages. While the wines are inconsistent this gives the potential to find a great wine for a bargain price. The best bet is to stick with the more well known producers in these off vintages. 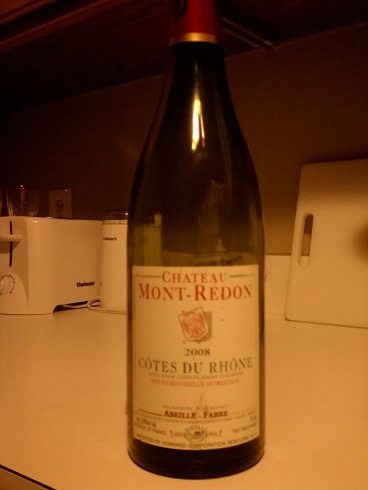 Chateay Mont-Redon is one of our favorites in Rhone and I’m always willing to give them a try. While we were in Switzerland we had a 2008 Vieux Telegraph Chateauneuf that was out of this world. colonelgrape: 80. This wasn’t the super rare amazing 2008 we were looking for but it wasn’t bad. Considering the $12 price I was happy with the quality but I’ve had better Cotes du Rhone at this price point from the 2007, 2009, and 2010 vintages. We absolutely love the 2007 Chateau Mont-Redon Chateauneuf du-Pape and next time I see their CdR from another vintage I’ll be sure to pounce on it. If you see a 2008 and you’re looking for a table wine for an every day dinner this wine works just fine. If you’re trying to impress someone, try the 07 or the 10. MobyGrape: 80. I once again epically failed a blind wine taste test. But since whether I get it right or wrong never changes the outcome, (meaning I still get to drink it all), I’m not terribly broken up about it. It smelled a little like foot, and had a rustic, earthy quality to it. I hope it wasn’t expensive, I’d consider it a perfectly fine wine to crack out for a non-special occasion. It was such a non-special occasion I can’t even remember what we ate with it. This entry was posted in Cotes du Rhone, France, Grenache, Mourvedre, Syrah on February 26, 2013 by colonelgrape.